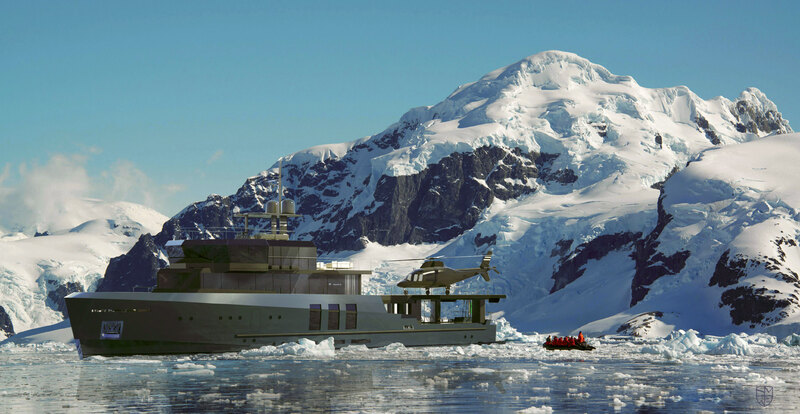 The new 43m explorer concept by Santa Maria Magnolfi is designed to go anywhere, at anytime, in any weather. Combining seaworthiness with comfort and safety in all sea conditions, the design is the result of careful analysis of the features and functions required to use the yacht all year round. 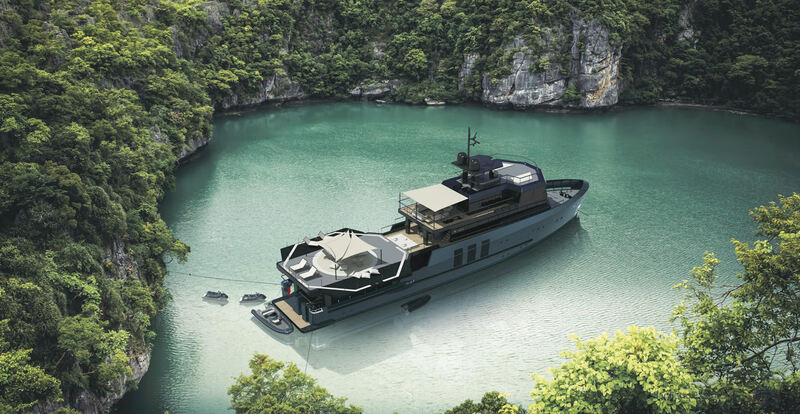 The rugged exterior styling borrows from the functional design of workboats and military vessels with an extended upper aft deck to provide a certified helipad when the folding side sections are deployed. When not in use for heli-ops, the huge area covering a total of 150 sq/m serves as an open-air dining or party space. The modular exterior layout can be arranged to suit individual client needs. The outdoor dining area on the upper deck, for example, can be completely closed off in colder climates by means of sliding glass panels. In similar fashion, the stairs leading from the upper deck to the lower deck can be connected to the main salon, so the gym and spa in the transom can be reached without ever stepping outside. The interiors are illuminated by large glazed surfaces to ensure constant interaction with the outside environment and seascape. Exotic natural materials from Italian marbles and exotic woods to Moroccan straw mats and Indian silk fabrics, reflect the yacht’s globetrotting vocation. Vertical metal finishes convey a sense of safety and sturdiness. The 58 sq/m upper deck is dedicated to the owner’s private use. The size of the master stateroom is unrivalled for a yacht in her class, while the hull-height glazing offer stunning views with direct access to the helipad. On the main deck, the full-beam salon features an almost square layout with ceiling-high windows, and a semi-open but air-conditioned winter garden that can also serve as a TV room. The sundeck, which spans the full width of the wheelhouse below, is designed as an observation area for whale watching or simply enjoying the sea views. Below the heli-deck is the tender garage protected by the folding wings of the helipad. The space can house a 6.8m tender (a 3.7m MOB tender can be stowed on the foredeck) and an array of water toys, such as jet skis or an amphibious vehicle. Amidships is an enclosed area with fitness facilities, steam bath and a large workshop. The crew and guest circulation routes are completely independent and the onboard services include a laundry, cold rooms and plenty of additional storage for long-range cruising. 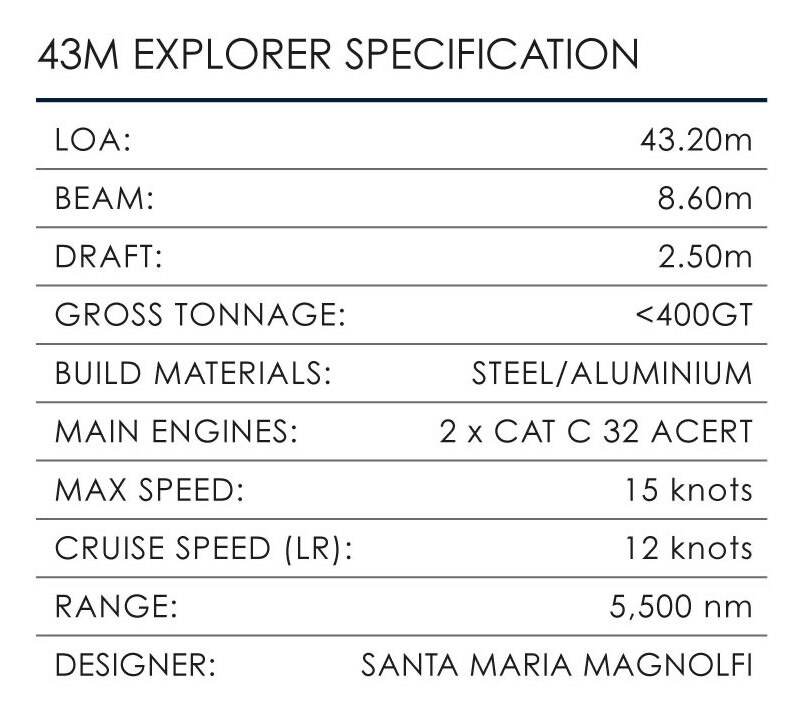 “The explorer yacht designed by Santa Maria Magnolfi stems from the shipyard’s will to build a boat that, while being a truly explorer vessel, preserves the elegance and style that one always expects of the Baglietto brand,” says CEO Michele Gavino.